Do you ever get into a side dish rut? I know I do. I fall back on things that are quick, easy, and familiar. Not that there’s anything wrong with that. Sometimes a weeknight full of kids’ gymnastics, laundry piled high, and spelling homework calls for a bag of frozen peas heated in the microwave, or Trader Joe’s mashed potatoes (which are fantastic, by the way). Other times, though, inspiration strikes and an idea floats down from the kitchen muses of something different to try. Like an herbed olive oil dip from a favorite restaurant. In general, we are a bread-and-butter-side-dish family. Bread and butter is our bread and butter. I think it was my college summer trip around Europe that first endeared me to the charms of this simple pleasure. You can’t visit France without getting hooked on crusty bread with butter (or, of course, cheese). Similarly, my husband’s relatives, New York Italians, scarcely have a meal without a loaf of bread and stick of butter on the table. I’ve come to embrace that tradition. There’s something so gustatorily delightful about the combination of soft, cottony white bread with cold, creamy butter in your mouth. (There, I said it. I like white bread. The nutritionist-in-training in me hangs her head in shame.) So I don’t mind getting a little stuck in a bread and butter groove sometimes. Recently, though, my husband and I had dinner at the chain Italian restaurant Carrabba’s, and I was reminded how delicious and unique their herbed olive oil is. I wondered if I could make it myself as a restyling of our bread and butter routine. Well, if course I could! This is 2015 and everything you ever wanted to know is on the Internet. Fast forward fifteen minutes and bam, here we are with a super flavorful dinner accompaniment. I even had all the ingredients in my pantry–you probably will, too, if you have an herb/spice cabinet. We had it with a lentil sausage soup (also a Carrabba’s copycat, soon to be blogged) and it made for a tasty fall dinner that was just a little different. So…easy, quick, cheap, and a familiar favorite from a restaurant? I think I can handle that, even on a busy weeknight. 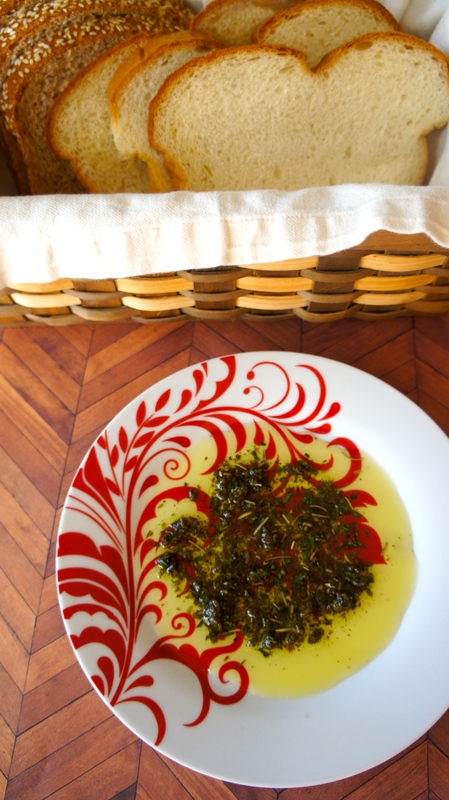 In a small bowl, combine all ingredients except olive oil until well mixed. Add 1 tsp. olive oil and stir to incorporate. To serve: place 1/4 of herb mixture on 4 individual plates. Drizzle an additional 1 Tbsp. 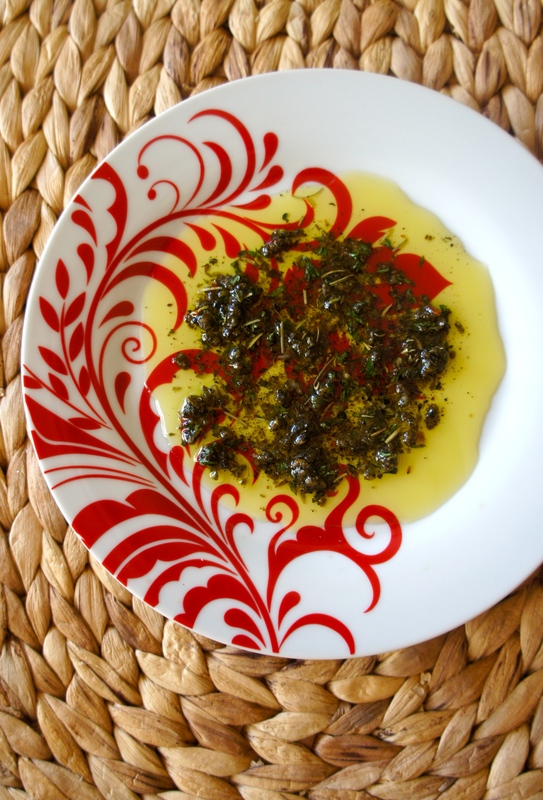 olive oil over herb mixture. Enjoy with crusty bread. This entry was posted in Recipes and tagged Appetizer, Gluten Free, Mediterranean Diet, Side Dish, Vegan. Bookmark the permalink.